Black Caviar’s sibling stole the show on Day One of the 2013 Inglis Australian Easter Yearling Sale where $38.9 million was traded on 127 of the region’s best bred and conformed young thoroughbreds. “Australian history was not only made with the actual sale of the Helsinge colt for $5 million, but in a huge win for the breeding industry the sale was broadcast live into thousands of homes on free-to-air television via Channel 7 Two,” said Inglis Managing Director Mark Webster. “There was a huge crowd assembled here at Newmarket all day and hopefully those and more people watching at home get involved in attending the races as owners in the future,” Webster said. The average price on Tuesday was $305,945, median $200,000 and clearance rate of 73%. The colt pushed his buyer, vendor and sire to the top of their respective lists by average and aggregate for Tuesday’s session. The progeny of champion Easter graduate Fastnet Rock were in high demand today, with 18 of his yearlings selling at an average price of $540,556, headed by colts from Gold Anthem and Dream Play purchased for Coolmore / China Horse Club. The Gold Anthem colt, a half-brother to champion sprinter Starspangledbanner, was offered as Lot 123 by Tyreel Stud and John Warren needed to go to $2.4 million to secure the youngster for Coolmore / China Horse Club. Offered by Kia-Ora Stud as Lot 82, the colt from Dream Play was knocked down to Tom Magnier for $1,500,000. Under bidder James Harron later secured the day’s other lot to break through into six figures when purchasing Arrowfield Stud’s colt by Snitzel from La Bamba as Lot 161 for an even $1,000,000. Horses passed in during today’s session are available for sale via the Inglis Make-An-Offer Service, which was well utilised in taking last year’s day one clearance rate from 74% at the close of the opening session to 83% by the end of the three day sale. 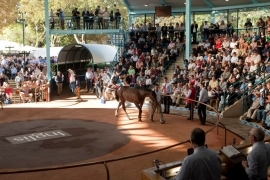 The Inglis Australian Easter Yearling Sale continues from 11am tomorrow, with Online Bidding again available for those not able to make it to Newmarket. InglisTV and TVN will again be broadcasting the sale, with Sky Racing providing viewers with hourly updates across their network.